Yvette Stanton is an Australian embroidery designer and publisher/author of quality whitework embroidery books. Yvette first developed a love for whitework embroidery when she learnt Hardanger in secondary school. Since then, her love for all whitework embroidery has grown exponentially! In 2000, Yvette entered a Hardanger embroidery that she had designed and stitched in the Nordic Needle Annual Design Contest, and was fortunate to be one of the 6 winners. Subsequent to this, she wrote "Elegant Hardanger Embroidery" which was first published in 2001 by Kangaroo Press. Following the publication of this book, Yvette was introduced to Mountmellick embroidery, and found that there was a lack of good information, so that decided what the next book was going to be about. Her twin sister, Prue Scott, an accomplished botanical artist, was enlisted as co-author for "Mountmellick Embroidery: Inspired by Nature". Yvette travelled to Ireland and England to research this book, meeting Sister Teresa Margaret McCarthy, and seeing many many beautiful examples of Mountmellick in museums. Prue designed the gorgeous patterns for this book, drawing on her knowledge and love of plants. Both Yvette and Prue stitched the projects, and Yvette wrote the stitch and knitting instructions. After having two books published by an imprint of a large, international publishing company, Yvette started to wonder whether she could possibly try self-publishing her books. As she trained as a graphic designer at uni and then worked in publishing house as a book designer for a number of years, she felt she had a good understanding of the industry. 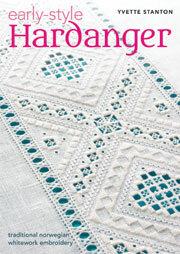 Her first foray into self-publishing was with the revision and re-release of "Elegant Hardanger Embroidery" in 2005. It was a steep learning curve, but was successful and encouraged her to continue with Vetty Creations as a publishing venture. Always searching for more whitework embroidery, Yvette learnt of the Ukrainian drawn thread work technique, Merezhka Poltavska at a beginners class at her local embroiderers guild. She was fascinated by this embroidery and sought to learn more. Instead of travelling to Ukraine, Yvette went to the fabulous Ukrainian Museum in New York because there she could see a wonderful range of historic examples, without the language difficulties! Photos taken at the museum are included in the resultant book "Ukrainian Drawn Thread Embroidery: Merezhka Poltavska", published in 2007 by Vetty Creations. During 2007 she fully revised and expanded "Mountmellick Embroidery: Inspired by Nature" into a full colour book, with much more information than the original edition. This 2nd edition was released at the end of 2007/beginning of 2008. During 2008 Yvette became quite sick with chronic fatigue syndrome. During this time Yvette was too unwell physically and mentally to be working or sewing, but as her health improved she wondered about getting to work on the left-handed stitch dictionary that she felt needed to be written. Because it could be broken up into bite-sized chunks, Yvette was able to work on small amounts when she felt up to it. During the process of writing "The Left-Handed Embroiderer's Companion: a step-by-step stitch dictionary" thankfully Yvette completely recovered. At the end of 2009, "The Left-Handed Embroiderer's Companion" was released to great acclaim. Towards the end of Yvette's time of illness, she wrote an article on how to care for people when serious or chronic illness strikes. If this is a situation you find yourself in, you may find it a useful read. Yvette and her family spent three months in Ethiopia at the beginning of 2010. While this did bring a bit of a break from the day to day workings of Vetty Creations, Yvette monitored the response to "The Left-Handed Embroiderer's Companion". She learned that right-handers were jealous of it, and so on her return to Australia, was able to complete "The Right-Handed Embroiderer's Companion". It was released in August 2010, and right-handers now enjoy their own companion stitch dictionary too! Early in 2012, Yvette released her book "Portuguese Whitework: Bullion Embroidery from Guimarães". This book has been extremely popular, with its mix of drawn thread work and bullion embroidery. It is a highly textural form of embroidery, and is its own very distinct style; one that is very eye catching. Yvette travelled to Portugal to research the embroidery in its native setting - something which she finds invaluable. To see historical examples of the embroidery, as well as meeting the people still working it, really helped to ground Yvette's book in the embroidery's traditional style. In 2013 Yvette travelled to Sardinia in Italy and was warmly welcomed by the craftspeople of Teulada, who were pleased to show her their traditional embroidery styles. Yvette enjoyed learning about Punt 'e Nù (meaning "knotted stitches" in the Sardinian language) and seeing historical and contemporary examples of the work. Yvette's book "Sardinian Knotted Embroidery: Whitework from Teulada" was released in mid 2014. In July 2014 "Sardinian Knotted Embroidery" was awarded "Craft Book of the Year" in the Australian Craft Industry Awards, judged by a panel of industry experts. In early 2014, Yvette travelled to "mystery country" to research a style of embroidery for her next whitework book. Again, she is focusing on a style of counted whitework embroidery from Europe. The plan is for the book to be published some time in 2015. Yvette Stanton regularly contributes a wide range of needlework projects to Australia's internationally acclaimed embroidery magazines, such as Inspirations, Australian Homespun, Embellish, Country Threads and Embroidery and Cross Stitch magazine. Yvette has also contributed to PieceWork (USA) and Finelines (USA) and Bordados Faciles (South America). We have provided a listing of her projects and articles in case you would like to check through your back issues. While traditional whitework embroidery styles are her main focus, she has also designed in a wide range of needlework styles including blackwork, Deerfield embroidery, naive stitcheries, cloth dolls, cross stitch, shadow work, patchwork and applique, candlewicking, and beading. Yvette Stanton teaches embroidery around Australia at shops and needlework guild groups, and is an accredited tutor with the Embroiderers' Guild of NSW. Because of her family commitments, Yvette limits the amount of teaching she does each year, and her teaching schedule is filled well in advance. If you are interested in having Yvette teach at your shop or group, please get in early to avoid disappointment! Yvette has many more ideas for books on whitework embroidery and embroidery stitches. She is continuing to teach, and looks forward to sharing whitework embroidery with many more people around the world. My embroidery is an act of worship to God, the ultimate creator.